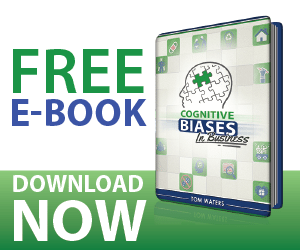 Our natural biases affect how we lead and who we follow. Understand them and sharpen your instincts. What is the Spotlight Effect? People tend to believe that others remember, or assign more importance to, their thoughts or actions longer than they really do. A lot of sales reps are concerned about coming off as a pest when engaging prospects in their pipeline. The dance between persistence and annoyance is very real but the misperception that your follow up is the worst thing in the world will only hurt your sales. One or two prospects who can get rude because they are not in the right mindset for a solicitation can encourage the spotlight effect and inhibit your ability to treat other prospects with a fresh attitude. Take note of your call ratio and record the number of people who are totally rude versus those who are neutral or positive. You will find the rude people to be in the minority more often than not. If not, you may want to think about updating your sales copy. Everyday Sales is an online resource for sales and business education. We expose the psychological exploits used in sales and marketing to empower our clients to become better professionals. Our feature content includes Sales in Cinema, Cognitive Biases in Business, Logical Fallacies in Business, and Quotes Deconstructed.